Nigerian Preacher Causes Outrage Over His Opinion On Domestic Violence. 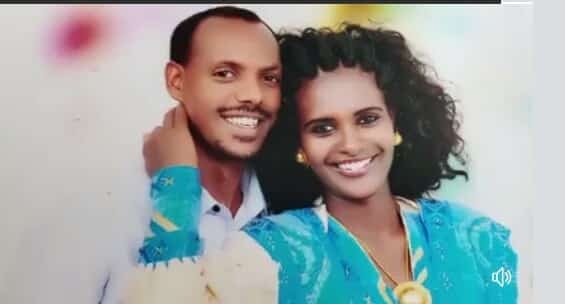 The truth of the matter is that there is no moral justification for domestic violence; and it does not matter the pedigree of whomever wants to colour the act as acceptable in one or two instances, it’s just not right! 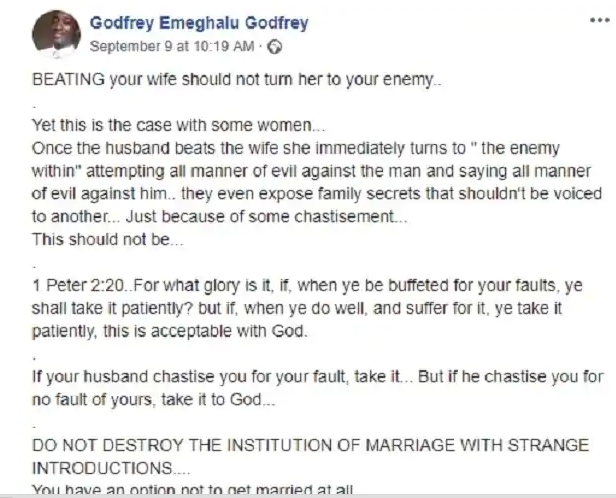 A Nigerian preacher identified as Godfrey Emeghalu Godfrey has unveiled his own opinion on domestic violence via social media. 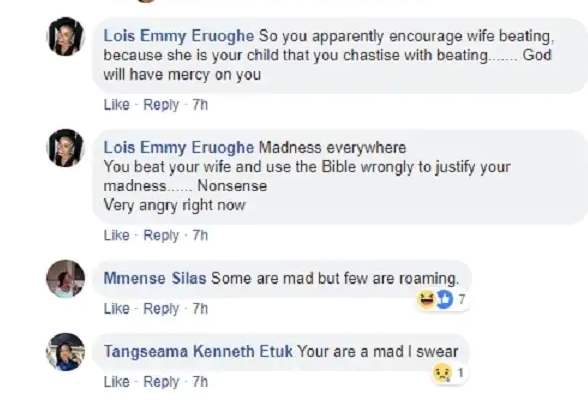 Emeghalu shared a post on Facebook, advising women to stay put in their marriage even when their husbands beat them to stupor. 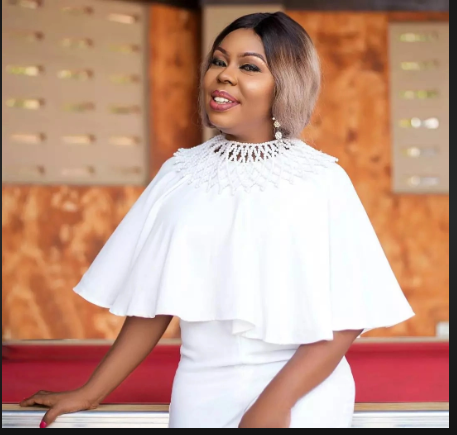 Emeghalu is of the opinion that women should stick with their abusive husbands in order to preserve their marriages, instead of bailing out or speaking ill of the man because of ‘some chastisement’. The preacher also quoted scriptures to defend his point. He stated that a woman should not turn herself into the enemy within because her husband hits her but instead, she should remain patient. Emeghalu further mentioned that if it’s the woman’s fault, she should take the chastisement and if it’s not, she should take it to God in prayer. 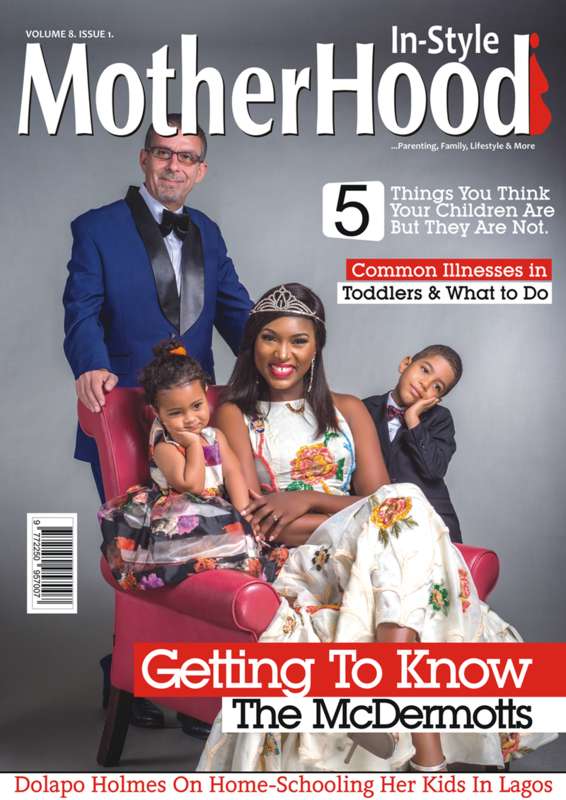 ”BEATING your wife should not turn her to your enemy..
1 Peter 2:20..For what glory is it, if, when ye be buffeted for your faults, ye shall take it patiently? but if, when ye do well, and suffer for it, ye take it patiently, this is acceptable with God. DO NOT DESTROY THE INSTITUTION OF MARRIAGE WITH STRANGE INTRODUCTIONS…. His post immediately sparked controversy on social media and many Nigerians wasted no time slamming the preacher for his absurd views. Ishmael Amenuveve Kpogo: “This is dumb. You’re supporting abuse. Which madness is this. You called beating your wife chastisement. Don’t forget that the bible says love your wife. If you love her you’ll not abuse her. Though Emeghalu’s marital status is unknown, many social media users are voting that he gets arrested.